View from back of house looking along screened in porch into side yard and court. View of estate from main drive. Long view of front porch. View of front porch looking down stone walkway. 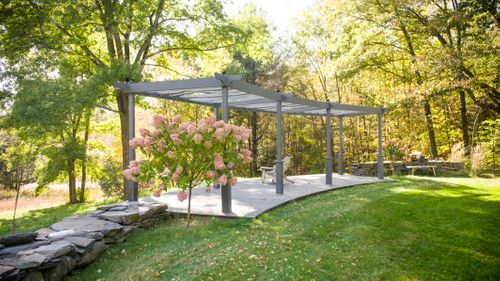 Walkway serves as a natural side aisle for covered entrance. Looking down stone walkway from house. Same view if entering ceremony from the stone walkway. Alternate view of stone aisle walk-way as approaching lawn and main porch. View of front lawn from porch. 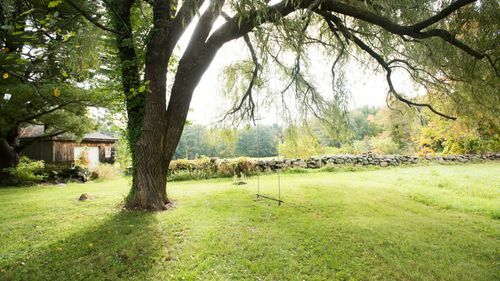 Lower stone serves as perfect ceremony spot over looking lawn. Alternate view of front lawn from porch. View of main drive and front lawn from 2nd floor balcony. Alternate view of front lawn from 2nd floor balcony. View of side lawn from front lawn. Perfect spot for free flowing cocktail hour. View of side of house and wrap around deck with screened in porch. View of side lawn and side of house. View from side lawn looking into front lawn. View of side deck and side lawn. View of side lawn and landscape. View of tennis court from side of house. Reception tent can be placed inside court or perpendicular and overlapping on court. Alternate view of side lawn and tennis court. Both swing and net can be removed. Close up view of tennis court with 50 foot opening. Long view of 110 ft x 60 ft tennis court. Alternate view of secluded court. Alternate view of court with adjacent play set. Play set would remain but can be used for child friendly weddings. View of play set and tennis court from side of house. View of play set, side of house and back yard from tennis court. Alternate view of side deck looking into back yard. View looking into screened in porch. View of hot-tub and screened in porch from back yard. Alternate view looking into screened in porch from back yard. 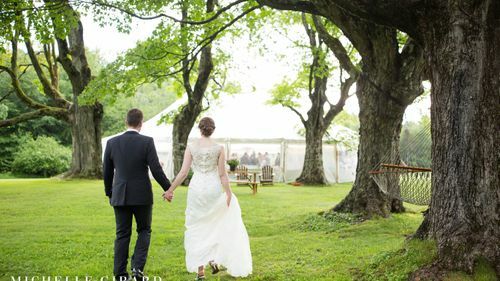 Located within 10 minutes of both University of Massachusetts Amherst and Amherst College, this large three story family estate boasts a lush open front lawn, second floor balcony with stunning views, columned front porch and side lawn with open deck and landscaped tennis courts perfect for a ceremony, free flowing cocktail hour and tented reception. Rent the home for the entire weekend for up to 12 guests, enjoying use of it's screened in porch, wrap around deck, and third floor bonus room with vaulted ceilings and abundant natural light perfect for preparing before the big day. 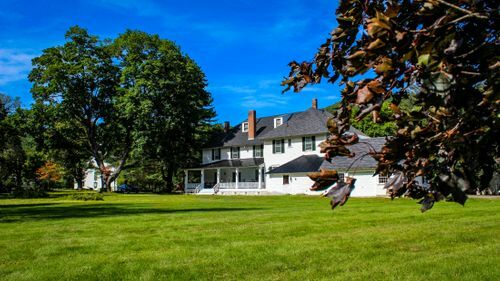 Receive your guests by shuttle to the estate's main drive lined with white picket light posts. Walk the aisle down a natural stone path enclosed with lush greenery where you'll exit to the front porch in front of your beloved guests seated on the open green lawn. 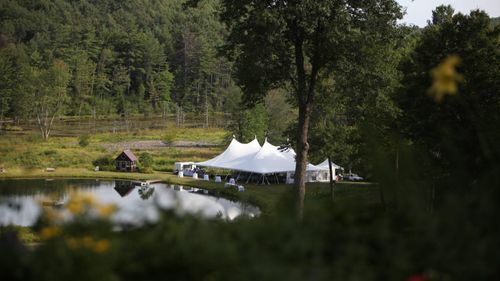 Transition to the side deck and lawn for a free flowing cocktail hour, followed by an outdoor tented reception atop on-site tennis courts enclosed with manicured shrubs and soaring trees for a private event just outside of town. Parking - Up to 8 cars. House guests and vendors only. Kitchen Access - Residential kitchen available for vendor use. Staging Area - 2 car garage available for staging and prep. Electric Power - Available from house at both ceremony and reception sites. Spacious, traditional style home with open concept kitchen, breakfast nook, formal dining room, and large living room. Features large master bedroom and bath with renovated third floor bonus room perfect for getting ready before the big day. Alternate view of screened in porch. View of side yard from screened in porch. Kitchen looking into breakfast nook. Breakfast nook overlooking side deck. Kitchen island looking into formal dining room. Formal dining room and stairwell. Living room and indoor fireplace. View of front door. Formal dining room on left. Office on right. Stairwell leading down to front door. Second floor landing leading out to second floor balcony. Alternate view of second floor landing. Perfect for bridal shots before the big day. Pets - Dog or cats of wedding couple only (outdoors only). No parking on lawn for any reason. Open Flame Policy: Open flames/candles upon request and with approval from local fire department. Town Ordinances: Local noise ordinance is 10pm. Music/noise must end by 10pm.